Back Mark McCrea and lock Dave Markham scored two tries each as Jersey opened their British and Irish Cup campaign with a 37-17 win over Carmarthen Quins. The islanders led 17-0 at half-time but backs Steffan Evans and Josh Lewis scored early in the second period to give the Welsh side hope. Markham's second helped Jersey to a 27-10 advantage before Rhys Thomas crossed the line for the visitors. McCrea's late try with the final move secured a bonus point-victory. Quins, who have started the Welsh Premiership season with four consecutive wins, could have taken an early lead but Lewis' penalty hit the left post and bounced clear. Jersey have been in front at half time in all six of their competitive matches this season. Instead it was Jersey who opened the scoring, on 11 minutes, when good work from full-back Jack Burroughs led to Markham scoring by the posts. A long-range penalty from fly-half Aaron Penberthy, making his first start of the season, extended Jersey's lead before McCrea cleverly chased onto his own kick to score just before half time. Quins burst out of the blocks after the break, with Evans scoring in the corner and then four minutes later Lewis' try reduced the deficit to seven points. But the islanders hit back, largely thanks to the work of Tongan international Paula Kaho. The number eight burst through with a superb run and, when he started to tire, offloaded to Markham to finish. The Welsh visitors still had hope though as prop Thomas powered over. Both sides searched for a bonus-point winning fourth try, and it came from the final move of the game as McCrea intercepted in his own half and sprinted clear to ensure his side hold the early advantage in pool five. In Saturday's other match in the group, cup holders Leinster A took four points from their 31-24 win at Plymouth Albion. Jersey: Burroughs; Pointer, McCrea, Hoskins, Dawson; Penberthy, Glynn; Lancuba, Harris, Herriott; Campbell, Markham; Maidment (capt), Buckle, Kaho. Replacements: Garcia-Veiga, Brennan, Rae, Noone, Robling, Bishop, Griffiths. 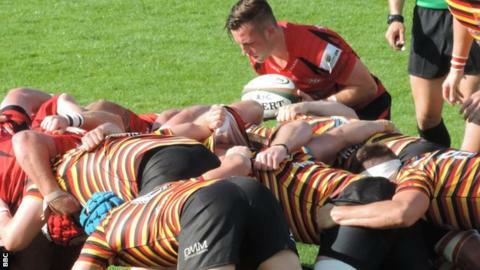 Carmarthen Quins: S. Evans; Adams, Hughes, R. Williams, J. Williams; J. Lewis, Hardy; Thomas, Myhill, Edwards; Griffiths, Kelly (capt); S. Jones, Boyde, Day. Replacements: L. Lewis, Robinson, Taylor, Osbourne, L. Williams, D. Jones, I. Evans.